So often when we see "other people"
who appear to have formidable handicaps or behave significantly different than "normal persons"
our first thought is to feel sorry for them. Mostly, this attitude is a learned response because we have no understanding of their physical condition or mental disposition. Society has taken giant steps to educate us in acknowledging abnormalities and supporting disabled persons by creating designated handicapped parking spaces and building access. Yet, we can not truly perceive living with impairments unless we ourselves become indisposed. Eileen Ornelaz does not feel sorry for herself. 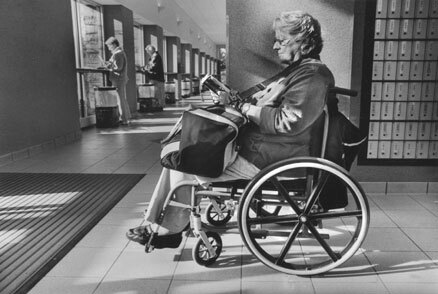 Although she is confined to a wheelchair she feels that she has been truly blessed in life. Born a feisty California girl she developed a degenerative neurological disease at age 25. She is also a cancer survivor. She has now discovered that every day is a true miracle and that going slowly down the pathway of life brings her many opportunities to see beauty and find pleasure in very simple things. Eileen wants us to know that physical impairments do not affect a persons mental abilities and that everyone we meet is really the same on the inside.